There can be times when you see the rankings of your website dip suddenly. You may find that lesser traffic is being directed to your website but your SEO strategy is excellent. The ranking of your website may have dipped because your competition has managed to implement a SEO strategy that is better than yours. 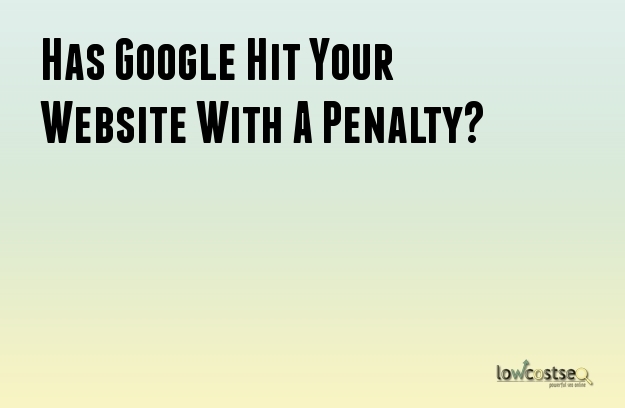 The other possibility is a penalty on your website. Google does penalize websites if they do not conform to the regulations demanded by the newer updates of their algorithms. It is however, hard to keep track of the updates and their regulations. This can be problematic when you are trying to rectify the penalty and raise your rankings again. Be that as it may, it is not impossible. You just need to follow a few steps to find out the exact source of the penalty and then rectify accordingly. Get your website registered with the Google Webmaster Tools. You can use the webmaster tools to receive notifications and news directly from Google which can be helpful in the future. Check your account with the Google Webmaster Tools to see if there are any notifications that state a manual action was performed on your website. A manual action is undertaken by employees at Google manually. The employees may have identified that some of your inbound links are potentially spammy. You need to rectify the problem and then file a request with Google for reconsideration. If there are no notifications, you should check the analytics tool. It will help you identify the drop pattern of the traffic. If the drop was not sudden but spread out then the updates in Panda or Penguin were not responsible. You can consult with an SEO professional to help you take the best step. If the analytics show that the drops in traffic was sudden then check if the drop in traffic is only for the Google results. A drop that takes place for all search engines means that your SEO is problematic and needs to be rectified. A drop in only Google traffic signifies that algorithm updates are to blame. Try to correlate the date of the traffic drop and the dates of the latest updates in the Google Panda or Penguin algorithms. The dates can match either of them. The release date for each update can be found in the algorithm history page of Google. A traffic drop that coincides with an update in the Panda algorithm means that the update affected you. You will need to check the content of your websites one by one to see if the content has been duplicated in other websites. The duplicated content needs to be modified. An expert can help. A traffic drop that is caused due to a Penguin algorithm update. Penguin is used to delete spam and faulty links. Checking the Webmaster tools can help you identify which of your links are connected to spam websites. There are other tools that can be of help as well. You can remove them manually or get an expert to help.